The James A. Blumenthal Library at Maitripa College currently holds over 4,500 titles in print and multi-media materials, comprised chiefly of texts in English. Additional titles include videos of teachings and films, audio teachings and guided meditations, magazines and journals, as well as Tibetan, Sanskrit, and Chinese works. The goal of the Library at Maitripa College is to develop a lending and research facility that will meet the highest standards of print and digital collections and information resources for the use of our students, faculty, and local community for many years to come. Enrolled students may access the library Monday-Friday, 10 am – 5 pm during the school semester. Call or email for access between semesters and during summer. Please contact [email protected] for current volunteer opportunities and upcoming projects in the library. Please consider supporting new acquisitions for the Library by visiting our Wish List available through Alibris (click on the button below). By purchasing books from this list, you are helping to build a library at a Buddhist institute devoted to rigorous study, community service and meditative practice. Book donations are tax-deductible to the fullest extent of the law, and accompanied by immense gratitude! Please click here for photos and history of the library including the dedication ceremonies and puja in 2015. 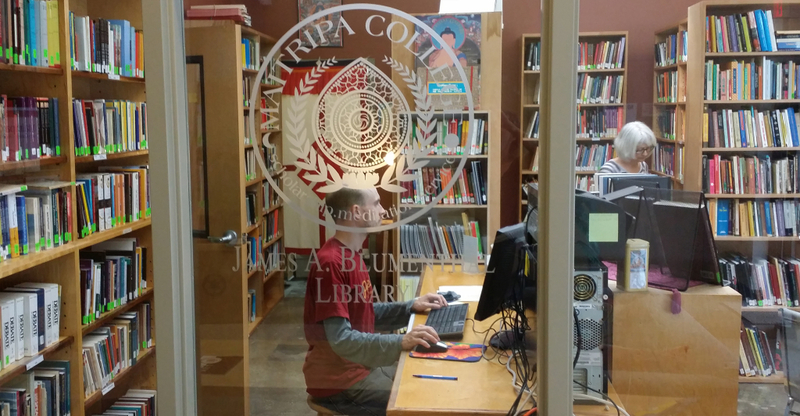 Subscription access via Maitripa College is available to library visitors via JABL computer workstations. Staff, faculty and registered students may access via Maitripa College by password below. Contact [email protected] for the password or in Populi (must be logged in). Comprehensive collection of authoritative periodicals and scholarly journals in Biology, Chemistry, Criminal Justice, Economics, Environmental Science, History, Marketing, Political Science, Psychology. Simplifies browsing through Gale’s more than 20,000 publications, providing the ability to search across more than 150 million documents. General OneFile is a one-stop source for news, magazine, and periodical articles across a wide range of general interest topics and academic disciplines.